Busy UK housing communications professionals rarely get time to meet other comms teams to compare teams and work experiences. So in early 2018, I asked PR and comms practitioners in the sector to take a short survey, where they could honestly answer how work is for them right now. Some patterns have emerged, and I have drawn an infographic showing statistics and comments that illustrate the more prominent trends I found in the data. For those who prefer words to scrawls, I have also written my findings in this post, below. Thank you SO much to those of you who completed the survey, and those who shared it with others. You can download the housing comms infographic, or look at all the data in the housing survey too – however, people’s comments have been removed so as not to identify any of the kind respondents who so frankly answered. You can also read my article about this in 24Housing: A housing comms cry for strategy. The housing communications professionals who responded to the survey LOVE their work. 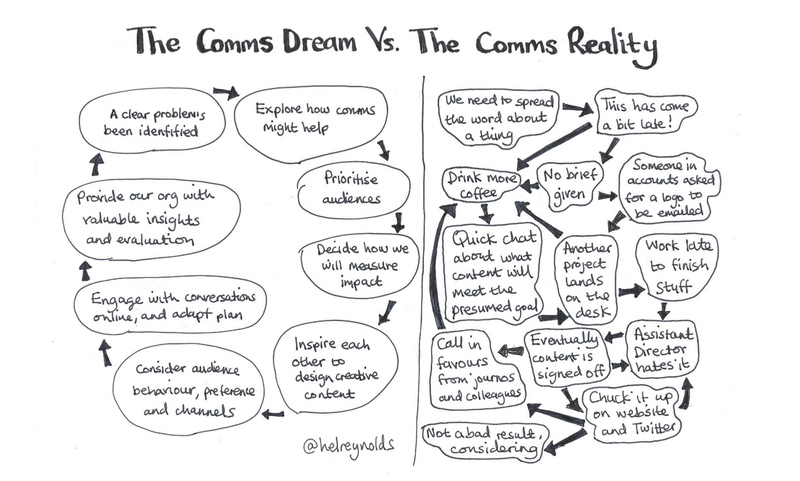 There are so many areas of expertise expected from comms teams. In housing, individuals are expected to be multi-skilled. Those surveyed are digital superstars, taking responsibility for their organisation’s social media and website, as well as more traditional PR functions. 92% reported that social media is part of their role. Housing communications professionals keep up to date with current issues. 85% read industry magazine Inside Housing. Many housing communications teams feel like they don’t get adequate support from leaders in their organisation. Half of those survey said leaders in their organisation underestimate their work. The topic most communicated about last year? News about our own organisations. The housing sector talks too much about and to itself. In summary, housing communications professionals have a sense of purpose and enjoy their work. But the sector needs to ensure they have resources, understanding and respect. Next steps for the sector are to create the conditions where communications teams can thrive; and to steer clear of talking only about ourselves, to ourselves. Thank you for the kind comment and the amazing word ‘cartooncomicinfographics’! I wanted to visualise the data and thought I’d go with what I enjoy most!